please contact us today at 1300 024 703 or click on the link below to enquire now and send us a message. RTO Recruitment Pricing and Packages! Why use 360RTO’s RTO Recruitment Service? RTO recruitment is a difficult, time consuming process… and getting the ‘wrong’ person is costly. Busy managers of small and medium RTOs have inadequate time to properly screen and interview job candidates to find the ‘right’ person for the job, leading to severe disruption and critical non-compliance in their RTO. The dedicated HR departments and recruitment tools employed by big organisations to find and recruit the top job candidates are simply out of reach for most small and medium RTOs – meaning you immediately start at a disadvantage when competing for the best talent for your RTO. Furthermore, “generic” recruitment agencies don’t have the detailed knowledge of our VET industry to properly assess candidate skills and knowledge – leading to poor recommendations and ‘bad’ hires. That’s why 360RTO Solutions RTO-specific recruitment service is so valuable – our RTO recruitment experts have specific, in-depth knowledge of the RTO industry – and know what knowledge and competencies candidates need to effectively operate your RTO and maintain compliance. As an additional service, 360RTO will provide you with access to RTO-specific recruitment expertise and tools tailored to the RTO industry, that are normally accessible only to huge organisations. Enquire now for complete information on all 360RTO recruitment services and packages! Create unique and effective job descriptions – job descriptions that focus only skills and specific experience rarely attract high performing candidates. To help you attract the best, our expert recruits will develop targeted descriptions that highlight exactly what your new hire will achieve to be successful. 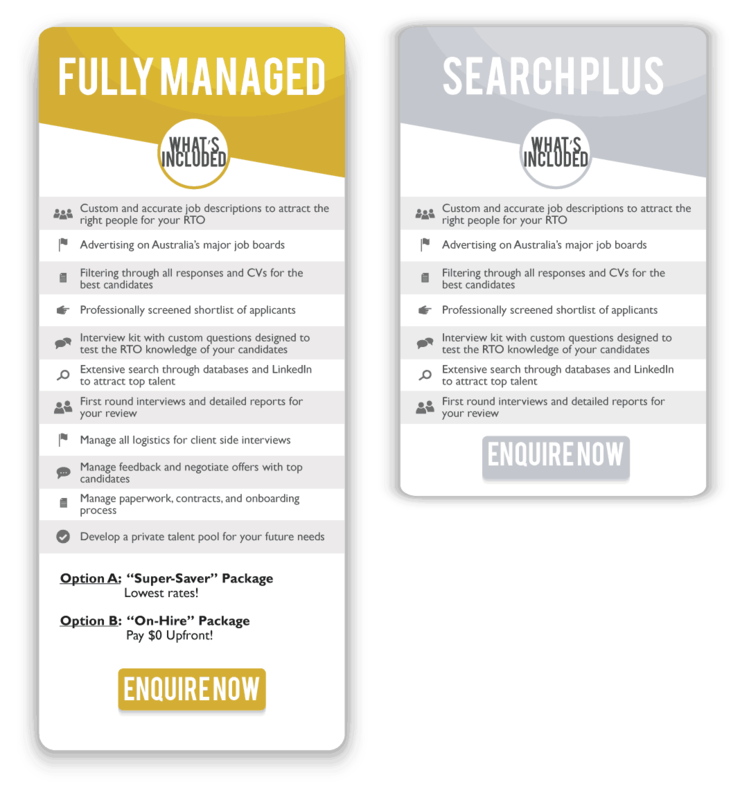 to know more about the Search Plus Package! to know more about the Super-Saver Package! to know more about the On-Hire Package! Enquire Now for RTO Recruitment Pricing and Packages!